Normally, when we think of German wine, Riesling occupies the first 10 choices. The wines from the premium areas in the Mosel and Rheingau are as good as any wine can get - from anywhere. So, naturally our ears perk up when we're talking German wine. Except in this case, the grape is Wiessburgunder, also known as Pinot Blanc. The estate is now in the hands of the fifth generation Willems, Carolin, who produced her first wines in 2001. By 2010, she had garnered many accolades, including Young Winemaker of the Year, and has never looked back. The name is also unique, but for a very good reason. It was originally just Willems, until Maria Willems married Karl Willems. Turns our they shared a distant common ancestor, so they changed the winery name to Willems Willems. Another interesting fact is that for the last 100 years, the estate has been run by, and the wines made by, the women in the family. That could explain why they taste so good. Their vineyards are on a south facing slope of the Mosel tributary known as the Saar. Here, the sun exposure is just enough to ripen the grapes to perfection - and perfection is what we have here. Luscious pineapple, fig and lychee abound, supported by flecks of orange blossom and quince. 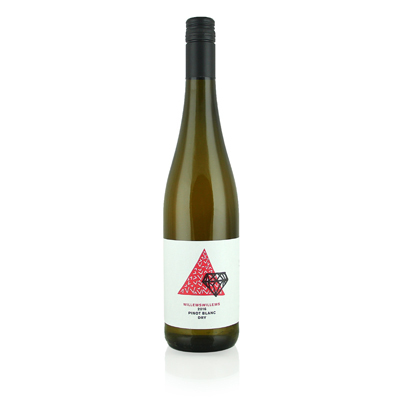 The flavors coalesce into a magnificent whole from the piquant acidity to the vibrant finish.